PortCityDaily.com is your source for free news and information in the Wilmington area. Middle school history buffs from area charter schools recently faced off in a first-of-its-kind academic competition. Roger Bacon Academy’s (RBA’s) inaugural Classical History Bowl, held earlier this month at Douglass Academy in Wilmington, pitted students from Charter Day School in Leland against Columbus Charter in Whiteville. The bowl tested students’ knowledge of world history, from 410 AD to present day. According to schools spokeswoman Sawyer Batten, RBA created the competition to both test and showcase the history-based classical curriculum implemented at each of its network schools. Competitors in sixth through eighth grades began studying for the event late last year, in preparation for the recall of more than 500 facts. During the competition, five-person teams from each grade level represented their home school in three, 20-question rounds. Students answered questions individually to contribute to their team’s score. In the end, Columbus Charter School’s sixth-grade team took home the win and Charter Day School’s seventh- and eighth-grade teams were victorious. 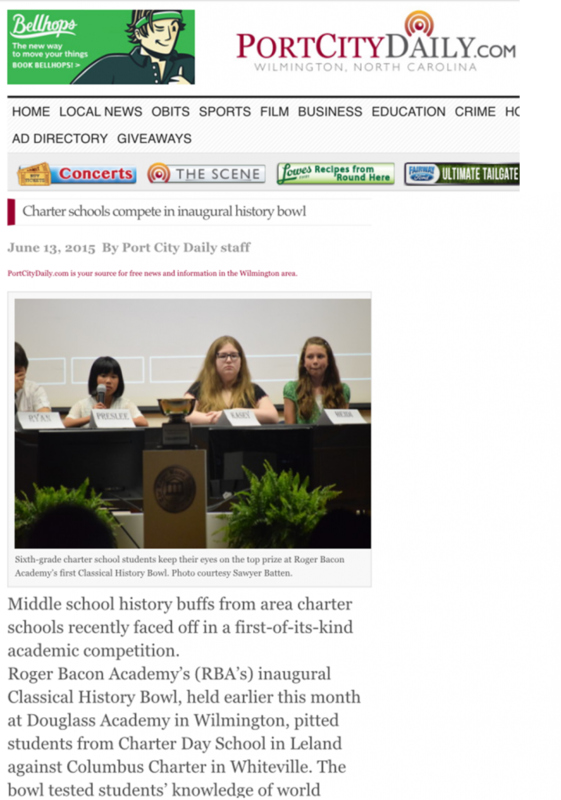 By calculating each school’s cumulative score, Charter Day School was named the first RBA Classical History Bowl champion. The school received a trophy, which will travel each year to the winning campus. To view the full story, click here!